Struggling With Your Garage Door? It’s easy to ignore noticeable changes in your garage door over time, or pretend that they're not a big deal. The thing is, these little things can be a signs of one or more problems that will certainly only get worse the more you neglect having a professional deal with them. If your door jerks a lot while it’s moving, becomes quite noisy, or stops suddenly in the middle of the process, there most definitely is a malfunction. Maybe someone accidently bumped into it with a car, or it got battered by a recent bout of rough weather. Or maybe these little hiccups are simply the manifestation of the accumulated toll of the constant daily use. Sometimes the problem can be obvious, like some busted panels for example. Our team will find new panels matching in your door in both size and color to replace the broken ones with. If the trouble happens to be some loosened parts, such as the bolts or tracks, our professionals will quickly get them adjusted. No matter what the trouble is, our professionals have seen it before. Our extensive knowledge means that whatever brand of garage door you have, we’ll be able to handle it easily. We have the highest quality replacement parts and professional tools available to not only get it back to being as good as new, but to get the job done quickly too . We don't know if every repair service knows how to take care of every different type of torsion and extension spring - but our technicians know. They're downright experts, in fact. With these components being some of the most important parts of the door, not to mention the ones most dangerous to handle as well, ensuring that they stay or, in case of damage, return to working condition is vital. Luckily, our team can make sure of that! Don’t wait for your trouble to worsen. 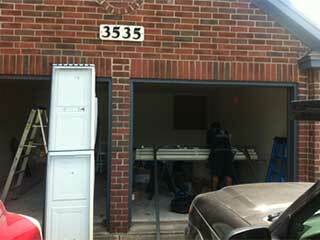 Our Garage Door Repair Peoria experts are only a phone call away.